Today is the last sneak peek day into the new May Reverse Confetti release! 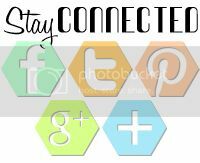 You won't want to miss anything, so make sure to check out all of this week's happenings over at the Reverse Confetti blog. Check out the awesome new products I used on my yummy card today! I stamped part of one of the Love and Ice Cream sentiments over a Love & Ice Cream Confetti Cuts dish, then layered up the scoop, cherry and spoon for a yummy cluster. 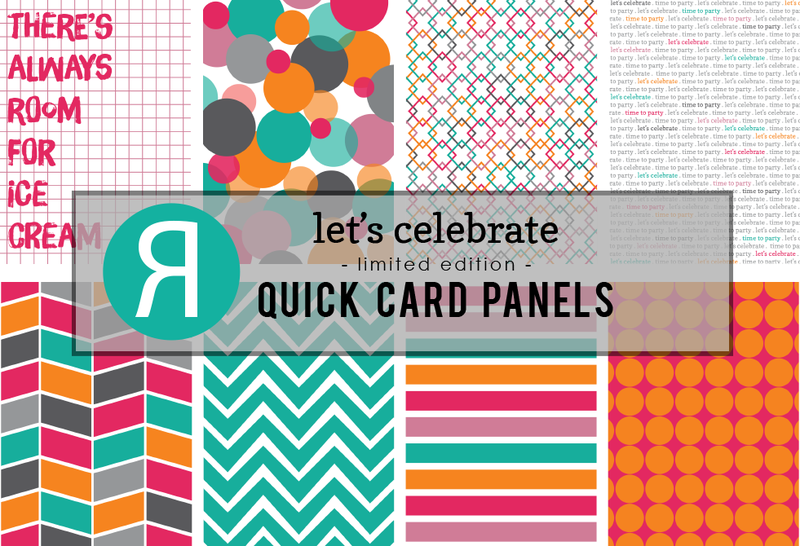 The new Let's Celebrate Quick Card Panels are a perfect panel to show off the new stamps and dies in this release. To embellish a bit more, I added a twine tied paper clip. Oh, and there is some sparkle to my ice cream scoop using some embossing paste and glitter. Head on over to the Reverse Confetti blog to check out what the other designers have created for today's sneak peeks! Bright and cheerful birthday card! Adorable.... love the woodgrain spoon and how you've used the quick card panels! 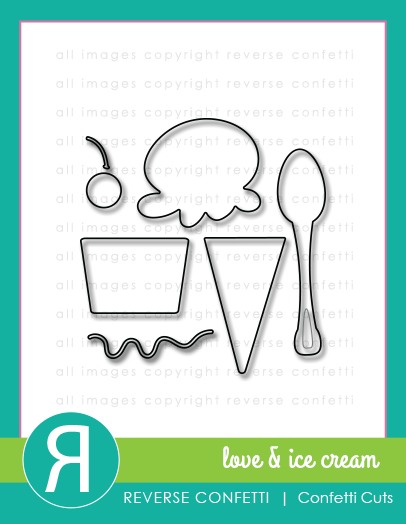 How absolutely CUTE is this ice cream design!!! Looks delicious. :). The pink papers and cute wooden spoon are perfect. Using the card with those words on it is a great idea. 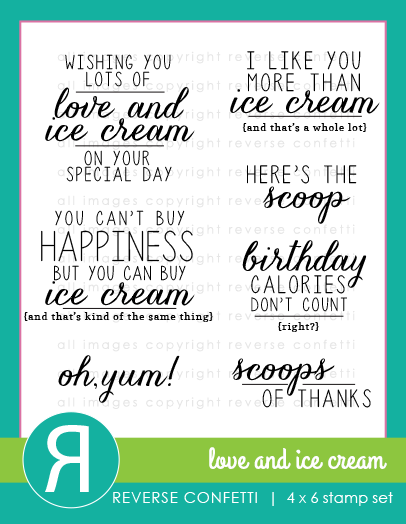 Very cute card and there IS always room for ice cream! Adorable pink sundae!!! Love the card panel too! Such a sweet card! And a wonderful release! What a super,fun card and so easy with the panel! Isn't that the truth? 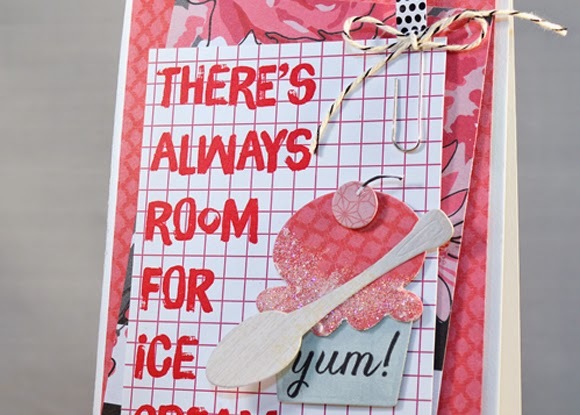 There's always room for ice cream and your cherry looking card makes my mouth water! Great layering. Let's eat! Love the sparkle on the ice cream! Sweet card! Love the layering. The colors are so pretty. Love the little wooden spoon - gorgeous card Stacey!! 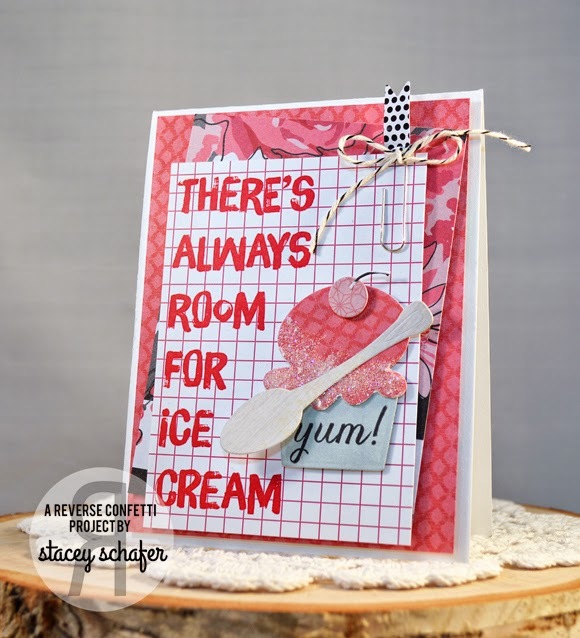 What a sweet card - the quick card panel is perfect combined with the ice cream dish. Ice Cream is the best!! You had me looking all over for that phrase stamp until I figured out that it was part of the designer paper. Super cute...makes me think of hawaiian shaved ice! I like how you added "sparkle to my ice cream scoop" to your yummy card. This is sooooo yummy! Darling card, Stacey! Hi Stacey!!! True that - always!!! Great layering and sparkle on the ice cream. the colors in your card are awesome!!!! with a cherry on top, pleeze! Love all the elements you added to this card! DUDE!! GMTA! LOL did you see my card? Haha!! Yours is fabby, love that spoon!! !